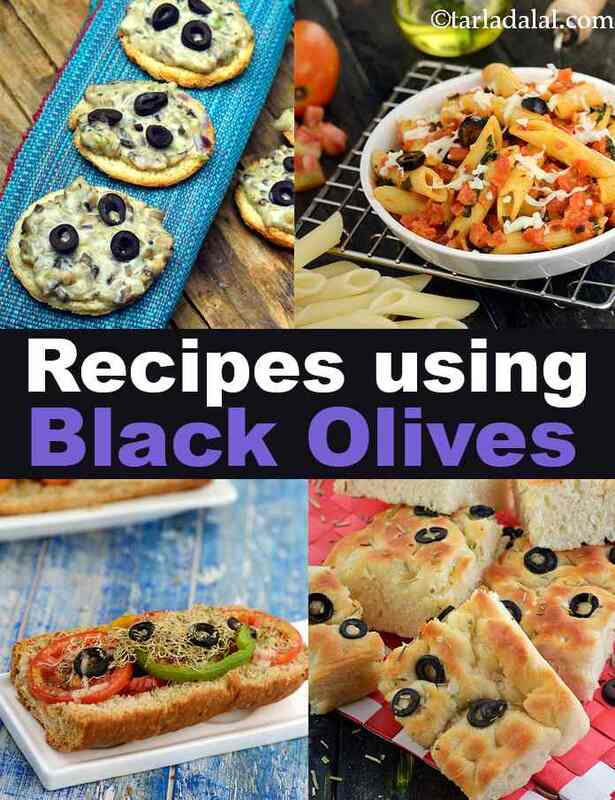 black olive recipe collection. Olives are fruits of the olive tree which was first only found in the Mediterranean region. Olives are the source of olive oil which is now extensively used all over the world for cooking and beauty purposes. Black olives are those which are picked when fully grown and fully ripe while the green ones are not ripe yet. Black olives are sweeter in taste than the green ones (which are salty and bitter) and both have a seed inside them. Even though it was first used only in the Mediterranean belt, it is not used all over the world. As fresh olives are not available easily, we use pickled olives that are a little sour in taste. Due to their unique taste and structure olives are used a lot in sandwiches and toasts. The flavor of black olives gets enhanced by other things like cheese, almonds and garlic which makes it fun to add on different things. Parsley and olive canapes are as delicious as they are simple to prepare. They can be made in under 30 minutes along with Sundried tomatoes and Cheese rolls, ready to be served to any guests at a party! Olives also make a wonderful addition to sandwiches, as you might’ve noticed in Subway, they are one of the favorite toppings for a Sub Sandwich! Not only can black olives be out on top of bread, they can also be put inside it. Confused? Let me clear that up. Focaccia is an oven baked Italian bread which generally has certain toppings baked in the dough itself. The most common topping here is olives because of the amazing taste it provides to the bread! This bread is served as a side dish in many Italian restaurants and homes. The best way to use olives is to add them to pasta. Penne Arrabiata is a simple tomato sauce based pasta with basic, wholesome flavors of tomato, garlic, basil and a kick from the olives. Italians use olives with no hesitation in many of their dishes. It is a preferred topping over many pizzas like a Spring onion and Olive Thin Crust Pizza. Greeks too love their olives. They are a regular addition to their most famous salad – the Greek Salad. This salad is a mix of different flavors and textures that come together wonderfully and is tied together with olives. Olives and feta cheese really complement each other's taste and are often served together on a cheese platter. But you can even combine them together in a Black Beans, Feta, Basil and Tomato Salad that tastes amazing! If you want to know more about the Uses of Black Olives, then you can check out our article on that. Enjoy our black olive recipe collection given below. Black olives mixed with garlic, cumin seeds and capsicum and topped with olive oil to marinate. They’re handy to pop in the mouth, piquant and an international favourite! These petite, bite-sized canapés, are ideal as starters at a cocktail party. Small though they seem, they are truly power-packed and kindle the appetite of the guests like never before! A thick crust pizza cooked in a deep pie dish with lots of toppings.